The 18-year-old Australian singer split from supermodel Gigi Hadid last month after an on-off relationship. Despite having admitted on Twitter Thursday night he was struggling with his feelings and unable to sleep due to being so “emotional”, Cody insisted in a new interview he is thrilled with his new relationship status. And while Cody had been romantically linked to actress Victoria Justice, he told the outlet he is most definitely “single”. 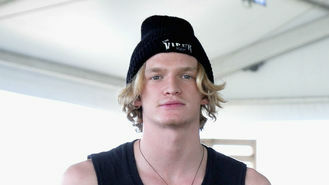 Cody is currently preparing to release his new album Free, which reaches shelves on June 23. The blonde heartthrob noted his breakup helped him find inspiration for songs on the record. Cody is now doing his best to promote his record. He’ll be touring soon, and can’t wait to share his sound with fans. “I want to perform as much as possible to get the message out to more and more people over the course of the time,” he said. While Cody is single, his ex Gigi is reportedly romancing Joe Jonas. But while the relationship rumours have yet to be confirmed by either Joe or Gigi, the singer’s mother is holding out hope that the claims are true. Denise Jonas attended the 2015 Father of the Year Awards in Beverly Hills with her family on Thursday night. And asked if she had given Gigi her stamp of approval, Denise replied: “I don't know yet. I have to see. We'll see! Check with me in a month."